If you are good at working with your hands and have a passion for crafts, then an artisan career might be the perfect choice for you. To succeed in this profession, you need to complete craft courses and gain practical experience as an artisan. Italy is the birthplace of some of the world’s most famous artisans and offers the ideal schools where to learn some of the “Made in Italy” secrets. At Studiainitalia we are very proud to share some testimonials of students who chose our Craft Courses in Italy and either became creative professionals or expanded their skills to improve their artisan workshops or craft business. "For more than 27 years I worked as a journalist, until the “paper crisis” hit the sector. I was forced to reinvent myself, something that, sincerely, I really wanted. I always enjoyed working with my hands, the concentration needed to do it, the creativity invested, the result that - after hours of care - makes you smile and be proud of what you do and create. I wanted to learn to make handbags and looked for training courses, but in Spain there were few opportunities and almost no places where to study. I found Studiainitalia, booked a three-week bag-making course with an artisan in Florence, and packed my bags. I took great advantage of this experience, which was unique and intense, in the idyllic and magical setting of Florence. I brought back home so much knowledge and so many tricks, and as soon as I landed in Spain I made the list of tasks to start my own workshop. It was a long list with machines, materials, tools and a cutting table… but finally I was able to set up my work studio in my attic, where I design, plan and do my work. My creations will be soon on sale online on my website www.pepeberto.com. For me, this change of direction has not only provided me with a new opportunity to reengage in the career world, but a new way of life and inspiration, an activity where I can invest my creativity as I please, with the enormous satisfaction of creating something on my own. Ciao Firenze, I will be back!!!" "Florence, Italy, language, discover, imagine, dream, learn, communicate, perfume, color and many other things ... is a summary of what I experienced in Florence when I went in July 2017 to do a course in Florentine pottery painting. [...] Every day I would cross the Ponte Vecchio to reach the pottery painting workshop, and this city would surprise me at every step. Living in the cradle of the Renaissance is a dream for those of us who dedicate ourselves to art. The ceramic painting school is a welcoming place where the pottery skills and love are perceived instantly. Opening the door was like entering a magical world. The teacher, Nicoletta, greeted me with a smile and right away I was painting my first work with the Florentine technique. A priceless experience in every way, in direct contact with people who love what they do and allowing me to improve my skills. Back in Argentina, I have been decorating objects with the Florentine painting technique. Some of my works have been exhibited at the Christmas fair held at the Spanish Theater of Reconquista. My workshop "Taller MCS, Magia, Creación y Sensaciones" is in Reconquista, Santa Fe (mdelccastroleiva29@gmail.com)." Taribba is a St. Lucian designer. She fell in love with the art of leathercraft while living in Ethiopia. Today, she is the owner of Même Bête, a brand of luxury handmade leather bags. Taribba trained in Florence, where she refined her skills with our Leatherwork Course. She shared her experience and thoughts on Instagram. 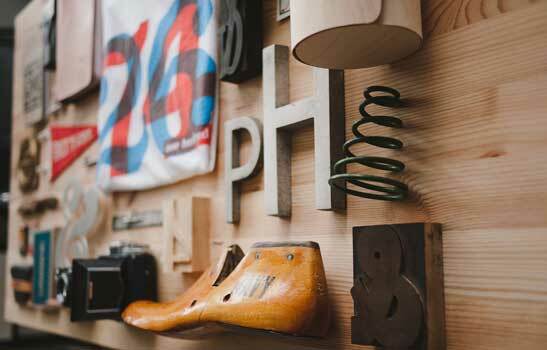 Do you want to become an artisan and work in the world of crafts? If you would like to produce inspiring work and survive in a competitive job sector as an artisan, choose your favorite Italian craft course or contact us with any questions about studying in Italy. We will soon launch a new project called “Creative Italy”, in collaboration with our partner Italian Special Occasions. It will offer you an innovative way to discover Italy through ancient crafts. Visit our blog soon for updates or sign up for our newsletter to stay in the loop. UNESCO, with its list of Intangible Cultural Heritage, recognizes the importance of encouraging artisans to continue to produce craft and to pass their skills onto others. Italian artists and artisans are among the most active and proud in sharing their knowledge. They know that keeping traditions alive is important for teaching the present and next generation about a shared past, and for safeguarding ancient trades that are slowly disappearing. When we think of ancient paintings or fashionable shoes, chances are that in our minds we picture a work of art by Leonardo da Vinci or a pair of stiletto’s by Ferragamo. Italy is the unchallenged birthplace of many forms of art and crafts. Yet, difficult economic conditions and the affordable prices of mass production have forced or persuaded some Italian businesses to transfer their factories abroad or to give up the use of manual work in favor of machines. But many artists and artisans have remained in Italy, stubbornly and proudly defending their old ways of work. Luckily, in a world that is ever-more globalized, many consumers and regular people are rediscovering authentic forms of crafts and appreciating their value. It feels great to own a leather bag that was handmade in Italy. But how cool is it to have a leather bag that you have created yourself in an Italian bottega (workshop) under the guidance of a local artisan? 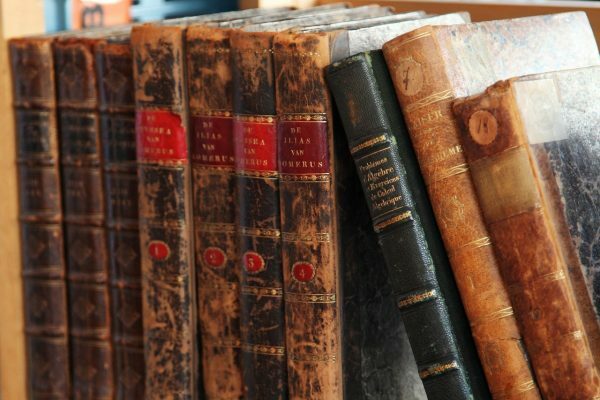 If you collect or simply love old books, wouldn’t you find it rewarding to be able to restore them, or to book-bind ancient paper sheets with the original techniques? Even in the domain of art, there is a growing movement for educated tourism, in other words for travel that goes beyond the explanation of tour guides or visiting a site just to take a selfie. After all, Italian art and architecture have long been the central focus of world history. Museums, art collections and historical venues have attracted tourists for centuries. But nowadays there seems to be a sense of renewed interest, urgency and desire to understand and appreciate the treasures of the past. Maybe this is partly due to recent problems such as the buildings that collapsed in the archaeologic site of Pompeii, the $30 million renovation project of the Colosseum, and the tragic destruction of the Palmyra site in Syria. All of a sudden, we realize that majestic buildings might not be there forever, and we stop taking things for granted. Hopefully, the collaboration between the public and private sectors, along with the input of organizations such as UNESCO and of common people who are genuinely interested in the preservation of ancient arts and crafts, will help Italy and countries around the world to preserve their tangible and intangible treasures in the centuries to come. Working towards this direction is our agency, Studiainitalia, specialized in cultural travel and creative tourism in the Bel Paese. Are you intrigued or inspired by the idea of learning with artisans and artists in Italy? Studiainitalia offers a variety of Art Courses, such as Painting, Sculpture, Xylography and Art History; Handcraft Courses like Shoemaking, Leatherwork, Bookbinding and Pottery; and Restoration Courses for Paintings, Furniture and Books - among many others. All courses are practical and take place in a bottega, where the master artisan follows the student(s) throughout two or more weeks. For travelers who want to make the most out of their Italian cultural experience, Studiainitalia can also combine the art and crafts courses with a language course. Browse through our course list or contact us now for more information! Florence is the World Capital of Art and Handicrafts, featuring hundreds of ancient botteghe (artisanal workshops). 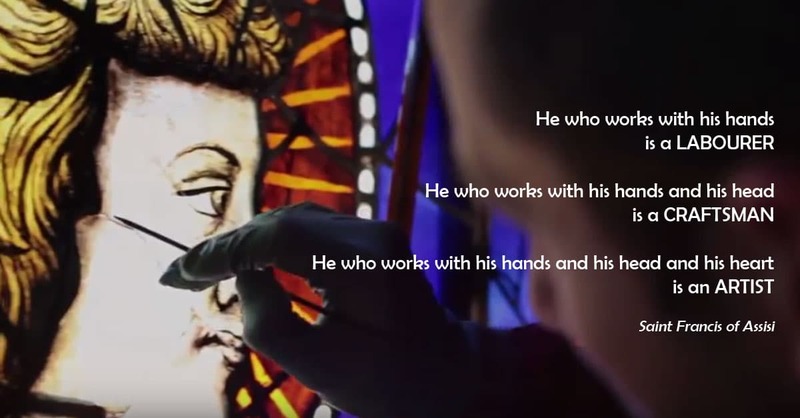 In this beautiful video, artists and artisans talk about their passions, history and work. Learn about how the Italian Renaissance was born in the small botteghe in Florence, thanks to the Medici’s, the geographical location, hard-working families and traditions handed down from generation to generation. Would you like to study in the capital of arts and handcrafts? 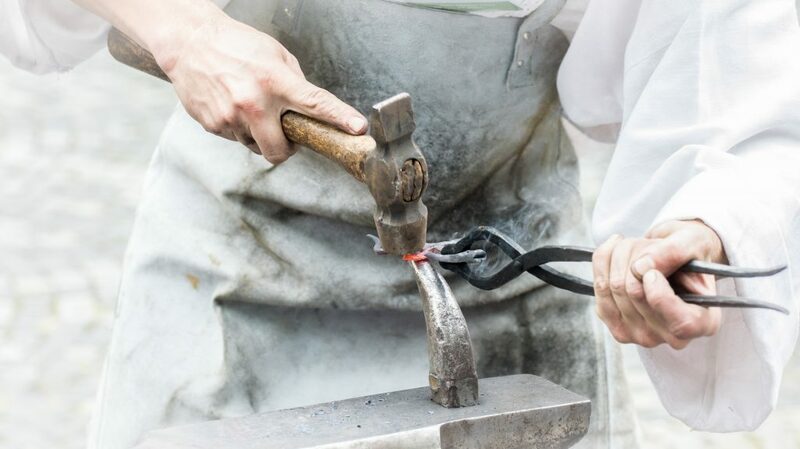 Become an artist by learning from master artisans in Florence! Studiainitalia offers a special 75-euro discount on all Art & Handcraft Courses in Florence during the months of November and December 2016. The choice is vast, from Painting to Art History, from Sculpture to Xylography; from Bookbinding to Leatherwork, from Shoemaking to Inlay and Gilding - and many more. Choose your favorite course in Florence now! Florence is perfect for fashion & shopping lovers. Let’s learn about the history of Italian fashion, shopping itineraries in Tuscany, and dressmaking workshops in this beautiful land. Italian fashion started to become the most fashionable in Europe in the 11th century, and reached its peak during the Renaissance. Florence was among the powerful cities of the time that began to produce jewelry, textiles, shoes and elaborate dresses. In particular, fashion in Italy was largely influenced by the masterpieces of Michelangelo, Raphael and Botticelli, and by clothes and accessories worn by members of the Medici Family in Florence. While Italian fashion in general fell into decline in the 17th century, Florence was among the cities where the clothing activity never stopped. In the late 19th and early 20th centuries, some of the first Italian fashion houses were founded, such as Gucci and Ferragamo in Florence, Bulgari in Rome and Prada in Milan. In the 1960s, the designer handbags produced by Gucci drew the attention of numerous stars and celebrities, such as Grace Kelly, Audrey Hepburn and Jacqueline Kennedy Onassis. 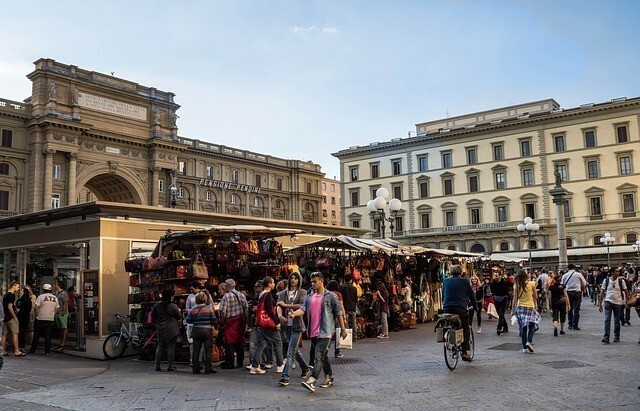 Florence was Italy's fashion capital in the 50s and 60s, and is still today considered an important center for the sector, featuring exclusive shopping districts. Florence and surroundings are the ideal destination for fashion and shopping lovers. If you are looking for the top luxury goods in town, head towards Via Tornabuoni and Via della Vigna Nuova. Here you will find all major Italian and international fashion brands! Florence is also a city of traditions, where you can buy high quality local handicrafts. For example, the town is famous for its leather goods, jewels and embroidery works. Looking for these? Make sure to stop by the market of San Lorenzo, where the colourful display of handmade leather goods will surprise you. 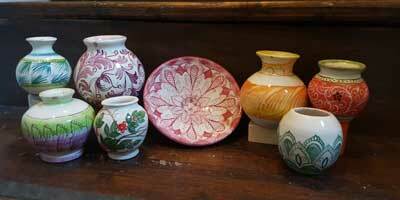 At the marketplace of Loggia del Porcellino there are lovely ceramics, marbled-paper objects and fabrics. Finally, Ponte Vecchio features amazing jewellery shops offering the best tradition of Italian goldsmiths. The Mall in Reggello (Florence), is the most famous shopping outlet in Tuscany, specialized in fashion designer shops. Gucci, Ferragamo, Cavalli, Armani, Valentino and Tod's for the Italian houses; Alexander McQueen, Burberry, Stella McCartney and Yves Saint Laurent for the international brands… you name it, and you will find it. The Barberino Designer Outlet is located in Barberino del Mugello (Florence), and offers more than 100 shops of the best brands selling almost everything from clothing to cosmetics, from electrical appliances to chocolate and shoes. Valdichiana Outlet Village is 30 minutes south of Arezzo. It features all the most prestigious Italian and international brands and all types of stores, for shoes, home furnishings, garments…. If, apart from shopping, you also enjoy creating your own fashion clothing, then there is no better place than Florence where to sign up for a course in dressmaking, tailoring and pattern cutting. Studiainitalia, an agency specialized in creative tourism and educational travel, offers a fantastic Pattern and Dressmaking course in the historic center of Florence, right in the workshop of a local master artisan. The course includes a phase of modeling on paper and a subsequent product realization. Then, students will study specifically the molding technique to get the general understanding of patterns, to finally create a complete garment. The course prepares students to a practical approach to fashion and couture, allowing them to assemble proper clothing, to learn about different techniques of sewing, and to recognize different types of fibers. Do you love books to the point that you want to help protect what is treasured in their pages? Whether it is antique books or more modern prints that motivate you, signing up for a bookbinding course or a book restoration course can be an extremely rewarding experience. But what is the difference between the two arts? Let’s find out with some definitions by Wikipedia. Bookbinding is the process of physically assembling a book from an ordered stack of paper sheets that are folded together into sections or sometimes left as a stack of individual sheets. The stack is then bound together along one edge by either sewing with thread through the folds or by a layer of flexible adhesive. For protection, the bound stack is either wrapped in a flexible cover or attached to stiff boards, and an attractive cover is adhered to the boards. Bookbinding is a specialized trade that relies on basic operations of measuring, cutting, and gluing. Today, modern bookbinding is divided between hand binding by individual craftsmen working in a one-room studio shop and commercial bindings mass-produced by high speed machines in a production line factory. An extremely durable binding can be achieved by using the best hand techniques and finest materials when compared to a common publisher's binding that falls apart after normal use. Bookbinding combines skills from other trades such as paper and fabric crafts, leather work, model making, and graphic arts. It requires knowledge about numerous varieties of book structures along with all the internal and external details of assembly. The goal of restoration is to return the book to a previous state as envisioned by the restorer, often imagined as the original state of the book. Books requiring restoration treatment can vary from the very earliest of texts to books with modern bindings that have undergone heavy usage. For each book, a course of treatment must be chosen that takes into account the book's value, whether it comes from the binding, the text, the provenance, or some combination of the three. Many times, books that need to be restored are hundreds of years old, and the handling of the pages and binding has to be undertaken with great care and a delicate hand. The archival process of restoration can extend a book’s life for many decades and is necessary to preserve books that sometimes are limited to a small handful of remaining copies worldwide. 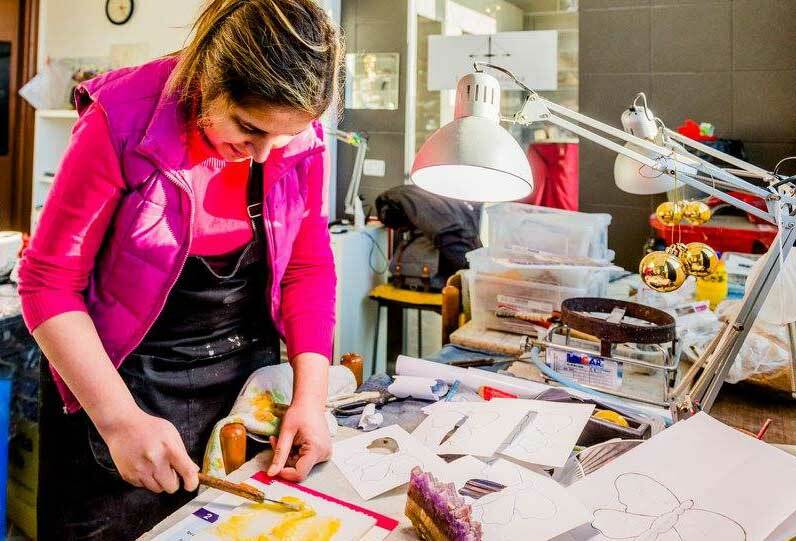 Studiainitalia, an agency specialised in creative travel experiences and cultural breaks, offers professional courses dedicated to bookbinding and book & paper restoration. These courses take place in Florence, where you can learn this ancient art in a typical bottega, or artisan workshop in the historic city center. You can book a 24, 48, 72 or 96-hour course and distribute your hours along the number of weeks of your choice. Click here for the starting dates of the bookbinding course and here for the dates of the paper restoration course. Local artisans will be your teachers. If you don’t speak Italian, you can apply for an interpretation service; or you can take advantage of your experience to learn the language by signing up for an Italian course in Florence. Whether you choose bookbinding or book restoration, you have access to an individual and hands-on course, which means that the programme can be adapted to your own needs. You will have local artisans as your teachers in the cheerful and informal atmosphere of their bottega workshop. They are masters concerned with maintaining Italian artisan traditions alive! Interested in knowing more about these experiences? Watch this video with testimonials of students who completed the Bookbinding / Book Restoration Courses in Florence by Studiainitalia. Florence is famed for its handcrafts and fashion brands, and you can explore the best of both worlds in its historic botteghe. These artisan workshops are authentic shoemaking schools, headed by master cobblers who have been in the trade for decades. Studiainitalia, an Italian agency specialized in creative tourism in Italy, offers a shoemaking course in a typical bottega in Florence. The shoemaking workshop is characterized by the care and attention with which staff members treat each and every course participant, in a cheerful and informal atmosphere. The course lasts for 2 or more weeks: you can book a 24, 48, 72 or 96-hour course and distribute your hours along the number of weeks of your choice. The program includes aspects of shoe design, quality of the materials, anatomy of the foot, knowledge of the utensils, use of the cutting knife, the shape and the heel, base models for the manual method and stitching, assembly and finishing phases. The course is individual, meaning that the program can be adapted to your own needs. It is taught in Italian: if you do not speak the language, you can either combine an Italian course with the shoemaking workshop, or apply for a translation service. At the end of the course, you receive a certificate of attendance, and all the models that you create are of your property! Click here for more information on the shoemaking workshop, costs and accommodation options. Florence has been the world’s capital of arts and handcrafts for centuries, and offers the perfect environment where to join courses of ancient processes and techniques. If you are interested in antique printmaking, you should not miss out on the courses of chalcography and xylography offered in Florence by Studiainitalia, specialized in creative tourism and language courses in Italy. Printmaking is the process of making artworks by printing, normally on paper but occasionally on fabric, parchment, or other support. The result are prints that have an element of originality, created under the direct supervision of or by the hand of the artist. Such fine prints are considered original works of art, even though they can exist in multiples [Encyclopaedia Britannica]. Chalcography is the art of engraving on metal plates, especially for printing and for illustrations in the production of books. The word derives from the Greek terms chalcos, copper and graphia, to write. The first available news on this print technique date back to 1450, when goldsmith Maso Finiguerra conceived it and used it in Florence. The most ancient book bearing chalcographies - Monte dei Santi di Dio by Antonio Bettini - was printed in Florence on September 10, 1477. However, its primacy is contested by Ptolemy's Cosmographia, printed three months earlier in Bologna and containing geographical charts engraved in copper plates. Xylography (also known as woodcut) is a technique for transferring onto paper an image carved in relief on a wooden block. Xylon, in Greek, means wood. It is likely that it originated as early as the 8th century in Chinese Buddhist temples. However, European use of the woodcut as a means to produce old master prints began in the 15th century. One of the earliest such works is The Fire Madonna (Madonna del Fuoco), an early woodcut that miraculously survived a fire in 1428, and still resides in the Cathedral of Forlì. Italian artisans raised the level of the craft during the 16th century. The printmaking workshops in Florence offer one, two or more weeks of Chalcography and Xylography courses. You can book a 24, 48, 72 or 96-hour course and distribute your hours along the number of weeks of your choice. 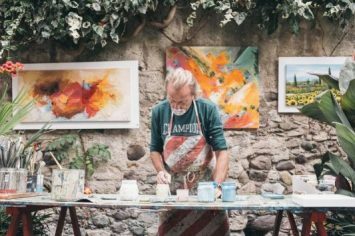 These hands-on courses are conducted by local artists, masters concerned with maintaining Italian artistic traditions alive. The programs are focused on a direct approach to the techniques. As a participant you will create sketches, prepare plates and blocks, and – at the end – you will print your artwork! The Chalcography and Xylography courses take place in a “Bottega”, or a typical artisan workshop located in the historic center of Florence. Here, participants will find a cheerful and informal atmosphere. Lessons are delivered in Italian: the course is very practical and it is not required to have previous knowledge of Italian language; however you can apply for an interpretation service or you can combine this course with an Italian language course in Florence. Need accommodation in Florence? Studiainitalia can help you with that too, offering a wide range of possibilities, from carefully selected Italian host families to shared apartments and private studio apartments. Learn more about Studiainitalia’s Chalcography and Xylography course, prices & accommodation in Florence. The art of paper marbling first started with coloring only the surface of paper in order to conserve it longer. As new and more sophisticated techniques came about and people became more educated, beautiful decorated papers were made to cover sacred books. The art of hand-decorating paper, probably started by the Arabians, is mainly used to finish the leather bookbinding. Easier techniques of paper coloring consist of manually spreading the color onto the paper. The earliest known type of paper marbling dates back as far as the 8th century in China. It was a the more complex floating technique that was brought to Europe through the Islamic Orient by the end of the 16th century. The color is thinned with gall and then dripped on a jelly substance made with boiled sea lichen or tragacanth; the paper is then imprinted with those colors that had been previously manipulated in order to create any type of pattern. Combs are used to create an infinite number of designs. During 1970´s the marbling art was brought back to life in Florence. Decoration of paper with acrylic colour in a bath of vegetable glue and techniques of decoration with special combs. Preparation of glues, proportions and resting times. Construction of special tools for combing of colour. Preparation of colours, dilutions an addition of soaps or waxes for creating different effects. Methods of spraying colour on the surface of the glue. Use of sheets to decorate objects like albums, boxes, pencils, pen holders, letter holders, and cards.